Frenzied Media Pore Over Home Of San Bernardino Killers During Live Broadcasts : The Two-Way The landlord tells NPR that he allowed journalists into the Redlands, Calif., home of Syed Farook and Tashfeen Malik after it was returned to his control by federal law enforcement officials. News media stand outside the home of San Bernardino shooters Syed Farook and Tashfeen Malik in Redlands, Calif., on Friday. 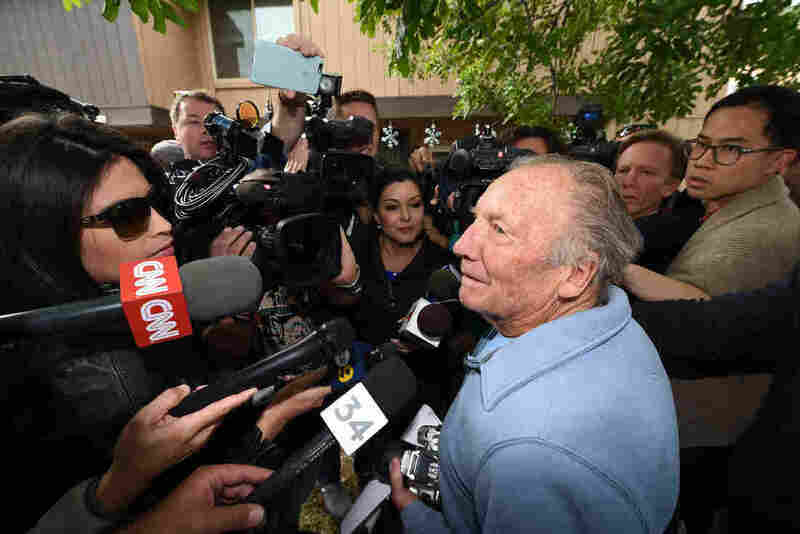 A story about a deadly terrorist attack briefly inspired a frenzied media scrum Friday morning in Southern California when dozens of reporters and TV news crews entered the home of the two shooters in the San Bernardino massacre. 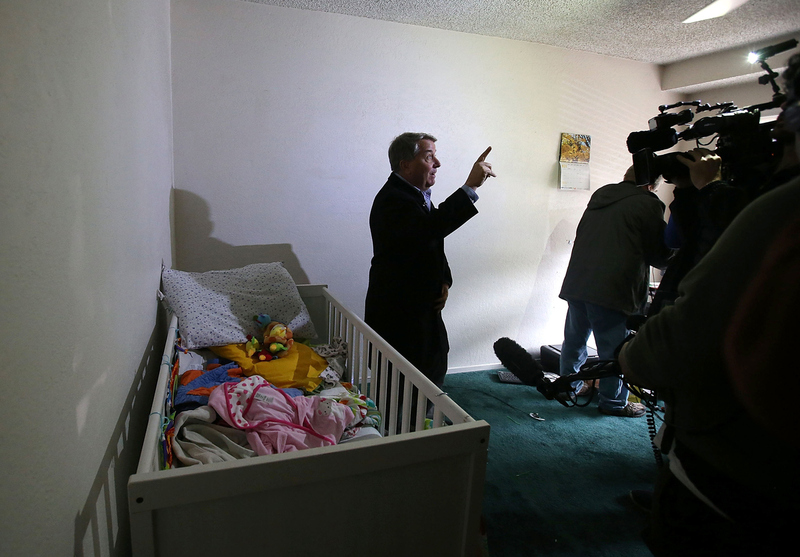 NPR's Nate Rott spoke to the landlord at the shooters' apartment in nearby Redlands after the scrum began. 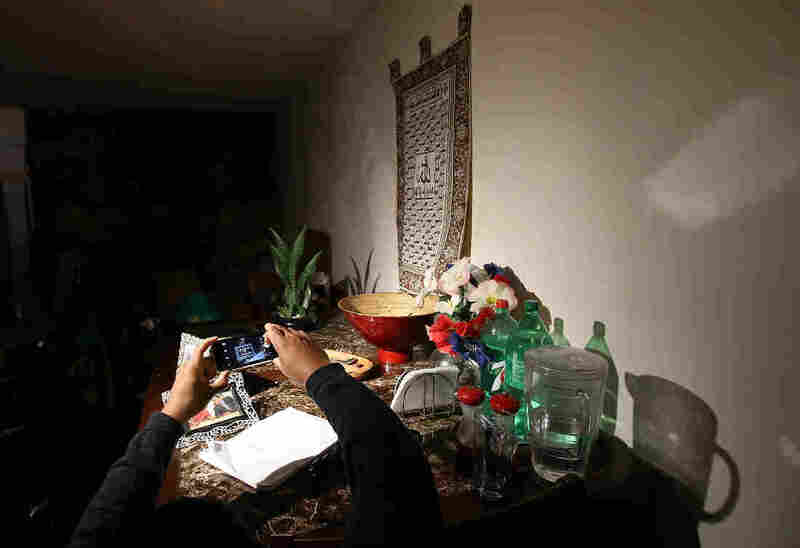 The landlord says he allowed journalists into the home of Syed Farook and Tashfeen Malik after it was returned to his control by federal law enforcement officials. Reporters quickly held up photographs to the camera, picked up documents and generally tramped throughout a site that had still been considered part of an active federal investigation just hours earlier. While all three major cable networks showed footage, MSNBC was particularly aggressive, claiming it had broadcast an exclusive with its footage, shown only a few minutes before its competitors. Indeed, MSNBC's Kerry Sanders complained that rival news teams were "a-pushing and a-shoving." MSNBC's Kerry Sanders does a live broadcast from inside the home. He subsequently held up photographs from the apartment, presumably of family and friends, and even showed a California driver's license of the mother of the male shooter. Her identifying characteristics, including her date of birth, address, eye color and the like, were clearly visible on screen. MSNBC issued a statement Friday afternoon apologizing in part for its broadcast: "Although MSNBC was not the first crew to enter the home, we did have the first live shots from inside. We regret that we briefly showed images of photographs and identification cards that should not have been aired without review." It was a notable acknowledgement of the absence of editorial discretion. CNN took a victory lap by issuing its own statement citing a "conscious editorial decision not to show close-up footage of any material that could be considered sensitive or identifiable." Fox similarly broadcast images from the shooters' home but did not show images of the IDs. Regardless, the scene was chaotic on all the networks, as though they were broadcasting live streams of reporters picking up scattered tiles of a mosaic and examining them one by one, without any hope of context or meaning. People on social media complained in real time, accusing journalists of voyeurism or worse. CNN's Anderson Cooper looked visibly uncomfortable, and Wolf Blitzer later said, "I've certainly never seen anything like this." One of CNN's law enforcement analysts watching the video live said, "I am so shocked I cannot believe it," though he appeared to be referring as much to the decision by law enforcement officials to walk away from the killers' home as to the reporters' activities. At a later press conference, David Bowdich, assistant director of the FBI office in Los Angeles, said his team had extracted all relevant evidence and no longer had any interest in the apartment. After about 20 minutes, the circus had devolved to outright farce. A CNN producer told Blitzer that the throng in the apartment was no longer composed simply of journalists, but of curious onlookers: "There's a woman with a dog walking into the house." NPR producer Becky Sullivan contributed reporting to this story.